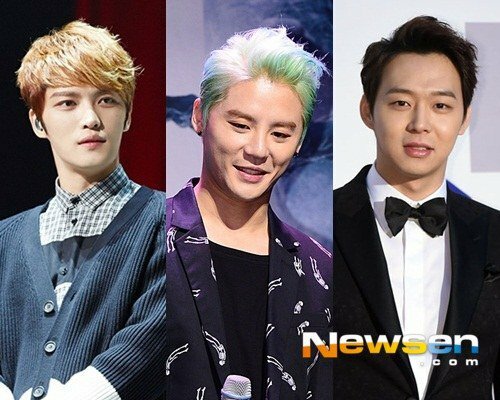 C-JeS Entertainment has confirmed that JYJ‘s XIA Junsu will definitely be performing at the 2015 Korean Popular Culture and Arts Awards, but the appearance of the other group members, Kim Jaejoong and Park Yoochun, is still under negotiation as they are currently in the military. Earlier in the day, a local news media reported that all three would be performing at the awards show, which is in its sixth year. The 2015 Korean Popular Culture and Arts Awards honors those who have made a contribution to the popular culture and the arts, including comedians, actors, singers, models, writers, and manhwa artists. The ceremony will take place on October 29 at the Nationl Theater of Korea and so far girl groups April and Girl’s Day have been confirmed for the celebration performances. JYJ will attend the Daejong Cultural Awards on the 29th. Military has granted permission for JJ and YC to attend!!! 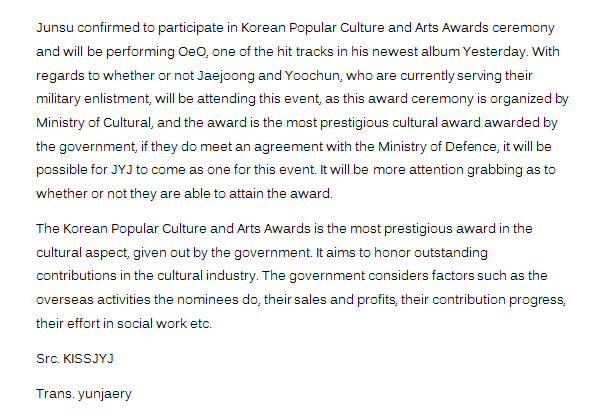 Junsu is confirmed to perform but not JJ and YC since the military has only confirmed that they can attend the awards ceremony. The award ceremony will happen on Oct 29, 2 PM at the Seoul National Theater.